SEONGNAM, SOUTH KOREA--(Marketwire - March 4, 2011) - In commemoration of the second anniversary of its launch, MMO basketball game FreeStyle, a popular game provided by a global game portal, GameKiss, added a new special character to its team members. The update is an outcome of full accommodation of opinions suggested through forums on the Website of FreeStyle. Unlike existing special characters, the new special character 'Garcia' allows users to decide its position and height as they wish. And exclusive items for 'Garcia' will also be updated, satisfying the thirst of users of GameKiss who have been demanding to have customized special characters. As a Latin American with a concept of tough wrestler, 'Garcia' is a member of Rio Hot Carnival Team. 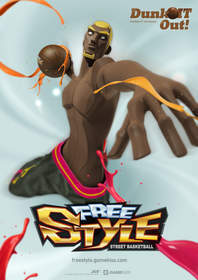 Since most characters in FreeStyle are confined to Asian and North American athletes, game users around the world have been craving for characters from wider regions. FreeStyle consists of two U.S. teams, a Japanese team, a European team and a Latin American team (new) with 24 men and 24 women 'basic characters' as well as 13 'special characters' with different individuality. FreeStyle plans to add 'special characters' and teams representing more regions in the future. Moreover, it will introduce 'limited edition gift box items' during the period of second anniversary events. These gift box items consists of new special costumes, which are not available in the current store of FreeStyle game, and will be sold only during the period of this event. It will be a good chance for users who want to set their characters in their own unique style. PM Roman Lee of GameKiss said, "FreeStyle is an online game that evolves steadily like a real-world basketball game. The ever diversifying demands of users are the driving force that takes the game to the next level. So we are making our best effort to meet the demands of users as fast as possible while monitoring their needs at the same time. We expect the second anniversary update will fully satisfy the needs of users." Further details of the 'second anniversary celebration of the update and events' of GameKiss are available at its official Website http://freestyle.gamekiss.com.